I visited the Googleplex yesterday for the Geo Developers Conference. They invited me to attend because of the work we are doing with our map mashups. 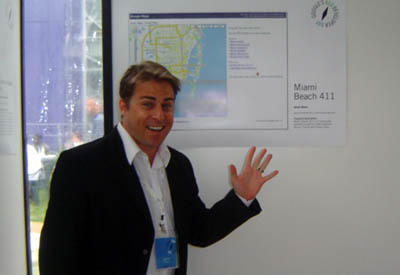 When I got there, I was surprised to see a giant poster of MiamiBeach411 in a gallery of sites they were featuring. I felt like a proud dad. They also allow employees to bring their dogs to work, wear whatever they feel comfortable in, and insist the engineers follow an 80/20 rule; which means 20% of your time should be spent working on personal projects. The Geo Developers Day started with a tour of the Google campus. I saw some really cool things. In the lobby, projected onto the wall are search queries currently being entered into Google. Just beyond the lobby, there is a giant whiteboard labeled “Google’s Master Plan.” It had a large flowchart where lots of people have written ideas on. I almost choked when I saw someone had written “Levitation” on the board, but our tour guide told me not to believe everything I read. There were also lots of toys, lava lamps, and photographs taken by Google employees on the walls. After the tour, we had a delicious lunch served in the courtyard. After lunch, we moved inside for a presentation to discuss the new features with Google Maps and Google Earth. 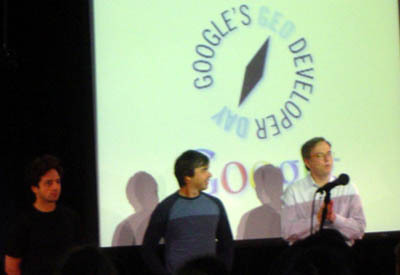 I was blown away when (Google’s co-founders) Sergey Brin, Larry Paige and (CEO) Eric Schmidt entered the room. I did not expect to see them. Our tour guide had just mentioned that although she had been working at Google for a year, she had only seen Sergey and Larry once. This was going to be a big day. It was inspiring be around the Google team. Just as the Walt Disney Company has recruited employees that are geared toward customer service, Google has done something similar. They have hired a group of smart people that believe in the company’s philosophy to do no evil. During the conference, there were no sarcastic remarks. There was no rolling of the eyes when an attendee asked a hard question. The presenters were gracious and excited to hear our feedback. After the conference, there was a reception and dinner. They had a jazz band playing. It was nice to see a Google engineer walk downstairs after a long day of coding to follow his 80/20 rule and jam with the band. For me, visiting the Googleplex was a dream come true. I felt like Charlie visiting Willy Wonka and the Chocolate Factory. I meet some great people. Namely, Mike Pegg from Gmaps Mania, Simon Marshall from the British Columbia Travel Group, John Coryat from Maps.Huge.info, and Rajesh Ramanand from FedEx. Thank you Google and the Maps team for hosting a wonderful day. Update: I made a short video of the after party. 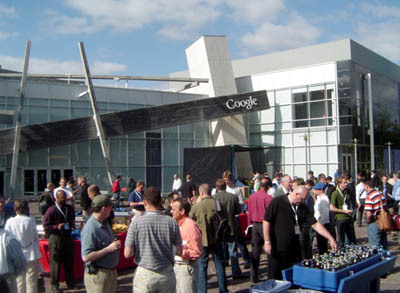 "Visiting the Googleplex for the Geo Developers Day"
I am quite jealous of your visit to the chocolate factory. Nice report, too! Excellent report! Wow! Thanks a bunch! I have a friend who used to work at google back in the ‘early days,’ and things have definitely changed. 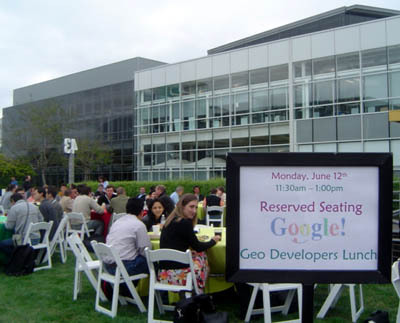 Google has six cafeterias in Mountain View, not two. Three are at the main campus, and the other three are slightly off the main campus, affiliated with other office buildings that are also slightly off the main campus. Hi mkh and Manola. Thanks for your comments. I just added your RSS feeds to my reader. I look forward to following your sites. Ducky, thank you for pointing that out. I only saw two cafeterias at the Googleplex. Do you know the name of the third? And those are some nice maps on your site. You obviously know your stuff. Man, I’ve seen some sneaky, blackhat tricks before, but this one takes the cake! How am I EVER going to compete with a guy who hangs with Sergey & Larry. Sounds like a great trip Gus! Congrats! Thanks, laurieb. The only bummer was Michelle wasn’t there. Great job Gus. We are very proud of you & the work your doing!!!!!! How busy are we tonight? Can I stay home? Oh, wait, that was last year. Seems like yesterday. Give everyone at Tuscan Steak my love. Hi Gus, it’s your sister. I’m so proud of you…I’m very lucky to have such a cool older brother, hopefully I’ll follow in your footsteps. Great work!! Hi Gus, the trip sure looked sweet! Was wondering if there will be another round of this GEO Day coming up anytime soon? Or perhaps you could point me to the resources? ThankS! There’s also some Google Groups that discuss the Maps API. If I hear of any news regarding next year’s Conference, I’ll update this post. Gus great report. I live in Scotland and will be vacationing in San Francisco during September 07 and wanted to visit the Googleplex, but I’m having difficulties arranging it. Any contacts/e-mails I could use that would help me? Thanks. Hi Gus, okay, here’s the roll-your-eyes question: where did you go for this? Seattle? San Francisco? Or do they have offices in different cities? I’m sure this is a perfectly obvious pop-culture detail I somehow missed out on, much like the first 10 seasons of Survivor. Can’t wait to buy all that stuff on the cheap when the truth comes out. IMHO, the massive click fraud will kick them squarely in the buttocks. I am very jealous. I have been dreaming about visiting the Googleplex for years. Mountain View, CA or Bust!